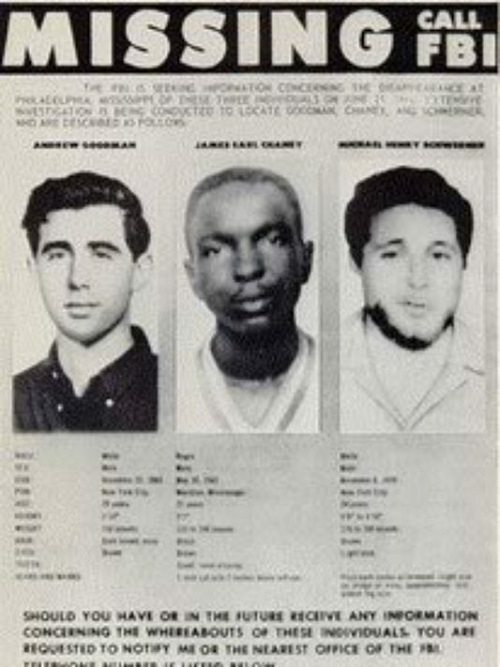 It is one of the ironies of history that the Presidential Medal of Freedom is being awarded posthumously to the three civil rights workers—James Chaney, Andrew Goodman, and Michael Schwerner—who were killed during “Freedom Summer” by members of the Ku Klux Klan outside of Philadelphia, Mississippi, on June 21, 1964. A second, equally compelling ironic counterpoint is occurring right now in Ferguson, Missouri. Fifty years ago in Mississippi, as the USA Today story makes clear, the ringleader of the Klansmen who killed the three, Edgar Ray Killen, escaped conviction because one juror held out against eleven others who thought he was guilty, explaining that she couldn’t jail a “preacher.” A grand jury in Ferguson is today debating not whether to convict, but simply to indict police officer Darren Wilson for the shooting death of unarmed black teenager Michael Brown. According to press reports, including leaks from the grand jury to the St. Louis Post Dispatch and the New York Times, Officer Wilson may not be indicted or prosecuted. Fearing violence in the wake of the impending grand jury announcements, people in and around Ferguson appear to be buying guns, particularly “home defense shotguns.” Some dimension of this is being hyped by right-wing websites that warn of “Ferguson thugs [that] arm and train themselves” and “Blacks Scaring White People.” These and other hyperbolic instigations seem like they could have been written 50 years ago by Imperial Wizard Sam Bowers and killing ringleader Edgar Ray Killen as they marauded and harassed and beat many Freedom Summer workers in addition to their murders of Chaney, Goodman, and Schwerner. After the killings of the three civil rights workers, President Lyndon Johnson became a lifelong civil rights advocate—the best that the White House has ever seen, bar none. Part of his conversion may have been due to the national and international condemnation the U.S. received during this horrific, barbarous period of American history. Today, Michael Brown’s parents are in Geneva presenting a report to the United Nations Committee against Torture. The Browns’ report makes the case for Brown as one of a number of “victims of torture and/or cruel, inhuman and degrading treatment at the hands of law enforcement” and questions whether the U.S. government is doing enough to educate and train law enforcement personnel so that they don’t perpetuate the treatment they say young Mike Brown had to suffer, reviewing law enforcement statutes regarding guidelines for “proportionate use of force,” and ceasing the arming of local police forces with military grade equipment. The organization that sponsored the Brown family’s trip to Geneva is the U.S. Human Rights Network, with prominent nonprofit and philanthropic leaders on its board of directors—to name a few, Martin Luther King III; Ellen Dorsey, executive director of the Wallace Global Fund (and formerly with the Heinz Endowments); Puja Dhawan with the NoVo Foundation, the foundation of Peter and Jennifer Buffett; and R.J. Thompson with Lambda Legal. There are consequences when racial injustices in the U.S. come to the attention of international bodies like UN committees. Critics might dismiss the Browns as simply grieving parents of a dead son, organizations such as HandsUpUnited and the Organization for Black Struggle as small and inconsequential, and UN bodies as impotent and feckless, but reading the text of the Browns’ statement reveals cogent arguments and sensible recommendations, such as demilitarizing police forces, putting front-facing cameras on cops, and seriously reviewing procedures and guidelines on use of deadly force by the police. Another recipient of the Presidential Medal of Freedom is Native American activist Suzan Harjo. Read more about her here.